Publishing is not evolving. Publishing is going away. Because the word “publishing” means a cadre of professionals who are taking on the incredible difficulty and complexity and expense of making something public. That’s not a job anymore. That’s a button. 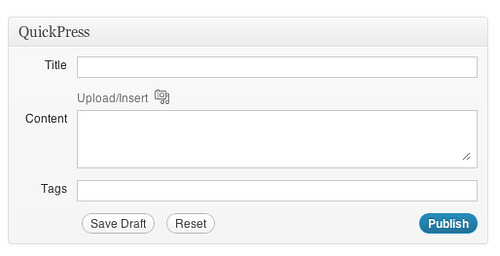 There’s a button that says “publish,” and when you press it, it’s done. There is definitely some truth here. The publisher's role of gatekeeper to availability has been reduced as the technical barriers to getting content from producers to consumers have eroded. I don't need a printing press or a distribution network to make my content available. I can post a message that the world can see by sending an SMS from a cheap cell phone. But that doesn't mean that anyone is going to absorb the message. It will probably be lost in the stream. My content is only going to be received if it is good, the right people are paying attention, and it hits them at a time and in a format that is useful to consume and share. Back in the days when publishing was technically hard, we tended to fixate on the mechanical part of publishing. The capital required to acquire printing and distribution capabilities served as a barrier to entry, but it wasn't the only one. Another barrier was having an attentive audience. This meant painstakingly building trust by offering reliable, useful, and/or entertaining information. The elimination of the technical barrier reduced the up front expenditure to get into the publishing game, but you still need to do the legwork to stay in it. We tend to discount the effort that "internet celebrities" invest in building a brand. Many of these people are driven by passion so it may not feel like a job, but it is a lot of work. I agree that publishing as a big, monopolistic business is dying. You can no longer get fat and happy as a middleman because the playing field is so dynamic and everyone has a chance to displace you if they do a better job. But even as we see big media companies in crisis, publishing is emerging as a discipline within all organizations. I am sure you have heard the phrase "all companies are publishers now." Corporate publishing has transformed from adapting paper sales collateral to the browser to executing a multi-faceted, multi-channel content strategy to inform and engage audiences on and off the website (email newsletters, mobile apps, Twitter, Facebook, Google, Stumbled Upon, LinkedIn...). Companies employ content managers, graphic designers, social media experts, SEO experts, and analytics specialists to understand, serve, and appeal to an audience as publisher traditionally would do. Collectively, this field is called "Marketing Operations" and it represents a lot of work — especially if you are operating in several languages and in many markets. This is what I do at Lionbridge. Pushing the "publish" button but may seem easy but it is just a small step in a much larger process to build and reach audiences. Prior to the publish button, there is planning around placement, timing, and what kind of formats to target. Perhaps adding a graphic or interactive application would help get the point across. These decisions should be based on the analysis of other content initiatives. There is work to get the content into the CMS (it often originates somewhere else), tag it for SEO and targeting, and instrument it for analytics. There may be a nee to test the content on different devices. There may also be the need to localize the content for different markets. After clicking publish there is work to gain visibility through social networks and email newsletters. Good bloggers know what I'm talking about and have been doing this for a long time. Large corporations are just learning about it. Then there is multivariate testing and analytics, tuning for search engines, and possibly purchasing ad words. Lastly is taking all that you have learned and applying it to the next iteration through the publishing cycle. Do this continually and consistently and your customers will love you and your prospects will notice you. Do it badly and your competitors will periodically check in on your website just to make sure that you are still in business. So, Clay, publishing isn't just a button. It may be losing its importance as an industry but it is becoming increasingly important as a discipline within marketing organizations for all industries. That "cadre of professionals" still exists, it has just refocused from getting something public to getting something noticed. And it took a new job in the marketing department under the title "marketing operations."